Stacy Horn » Blog Archive » I heard from my editor!! I heard from my editor!! I can’t believe I forgot to mention this. I heard back from my editor about my first draft. As far as I can tell she loves it, wants changes, and I love her changes. Aside from saying, “Stacy, the book is perfect, you are perfect,” this is as good as it gets. The changes are not huge, structural, re-do changes, which would have been a less happy thing to hear. But more along the lines of, “more of this, less of that” type changes, and a request for one more paranormal story, which means more research which I love. I figure I have two to three more months of work to do and then I will have a book! So, I’m happy. I have a meeting tomorrow with her and her assistant, and then it’s back to work. I’m considering today the last day of my vacation. This picture is of a sign above a school playground. 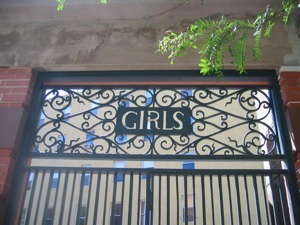 It reminded me of the playground at St. Philip Neri’s, where boys are girls were also segregated. I had a nice memory of the time I leaned over the painted white line which separated us and while the nuns weren’t looking snuck a kiss with a boy I liked. By the way, it was so swell running into you. We had a great “city” weekend. You’re lucky that the nun didn’t see you and smack your fingers with a ruler. Hussy!!!!! The news about your book sounds great, you must be so proud!!!!! Keep on kayaking – you should come out to Doug’s and kayak on one of his in Centerport Harbor. Doug has kayaks??? I didn’t know! Hi Ellen!! It was great running into you can chatting and catching up. It was fun!